Wild asparagus risotto with lemon and sage..and pulling off the road. I have a few risotto recipes that I adore. One is made with sweet potato, another with saffron, yet another with wild mushrooms and then…asparagus. 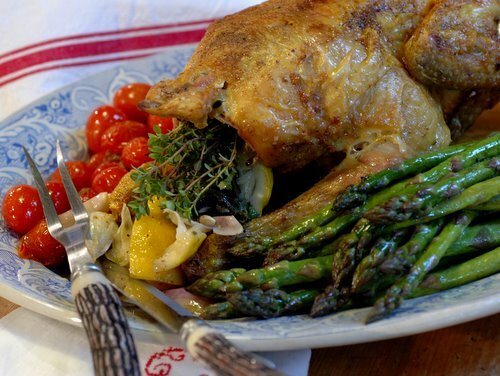 In this case I used wild asparagus with a very short season, but delicious while they last. Sauté the asparagus for only 3 – 4 minutes, in a large pan with olive oil, lemon wedges, a sprinkling of white balsamic vinegar, salt and pepper. Remove and keep aside. they should still be crunchy. Saute the lemon wedges a bit longer to caramelize. Heat enough olive oil in a small frying pan to cover the base. Add some sage leaves and fry until crisp. Remove and drain on kitchen towel. Sauté 1 chopped shallot in a little olive oil. Add about 1 cup of arborio or carnarolli rice and sauté for another 3 minutes top release the nutty flavors of risotto rice. Add 1/2 cup white wine and 1TBSP of white balsamic vinegar. Stir. Add about 500ml of hot vegetable stock, ladle by ladle to the risotto, stirring all the while over medium high heat. Chop a few leaves of fresh sage in thin ribbons and add to the risotto. Taste the risotto…the rice should still have some bite and not be mushed to a porridge. Add 1 TBSP of créme fraiche, 1 knob of butter and 2 TBSP of grated parmesan cheese and the grated rind of 1 lemon. Turn off the heat and stir through. Serve immediately – spoon the risotto onto individual plates. top with the asparagus en finish off with the crisp oil fried sage leaves. Sere with extra Parmesan on the side. Use garden asparagus or string beans instead of wild asparagus. Combine with tarragon instead of sage. Leave out the creme fraiche and use a soft goats cheese instead. Leave out the creme fraiche and sprinkle with crumbled feta cheese just before serving. The risotto should be creamy and not dry at all. When the bumps on the road get too disconcerting, I always pull off the road, switch off the engine, empty my mind and drift off to that world where I know giggles and laughter are plentiful. And smiles. That place where we run off to when life is too blue and we want it more colourful. They are our private corners where we deal with these road bumps in our own unique ways so we can be able to turn the ignition key and continue on the bumpy roads. I thought I would share some of the things I run to for a smile or a hearty laugh or a tickling giggle. I adore that first coffee of the morning.It turns me inside out with happiness. I love watching someone enjoying a meal with gusto and joy(and good manners of course), someone who has a visible appreciation for the goodness of good quality products and for the preparation that goes into a meal. I love people who can fold double with laughter, enjoying laughing so much you can hear it right in the pit of their stomach! It is contagious and I might not know what the laughter is about, but I have to join in, just for the sake of the joy it brings. I love that good sharp which some people have. Not jokes. Jokes are flat and boring. Wit is something completely different. It is an art. That ability to be able to catch a moment and react to it with just the perfect touch of irony and humor. I love the smell of horses…their sweat, their manes, the oil on their skin.. I love playing tennis; running for every ball, sweating, groaning like a pro, stretching, running, sliding…all of it.. I love my chickens’ eager trot-run when they see cheese in my hand, it makes me burst out in spontaneous laughter. I love watching the geese’s rhythmic swaying from behind. I love swimming..not lengths or any fashionable style, but splashing and diving and twirling and drowning… like a dolphin. I just love being in the water. I love waking up early morning to blue skies and sunshine..I can just burst with happiness. I love the smell of oil paints on my palette. I love a scalp massage when I go to the hairdresser. I love walking in my garden endlessly throughout the day, hoping I’ll see something new every time. I love having coffee and croissant with mon chéri in town and we talk about everything and anything, especially since he is a man of few words. I love my perfumes..I splash it on when I go to dinner, when I go to town, when I go to bed or when I go work in the garden. M favorite, you ask? But Coco , eau de perfum, Chanel of course. I adore my bed and I adore slipping into crisp linen smelling of sunshine. I fall asleep with a content smile. I hoe I have touched some of your soft spots or at least made you pull off the road to find your private world where laughter and giggles abound! Asparagus with balsamic sauce…and a brocante in Collonges la rouge. Stem or boil the asparagus instead of sauteing in oil if you want to cut down on fat. Make a vinaigrette of olive oil and lemon juice and balsamic and drizzle when served. If the asparagus are too thick, cut in half. Use thin green string beans instead. Instead of a poached egg, a soft boiled egg can be used. Chop a hard boiled egg finely, sprinkle on the asparagus and top off with a dollop of mayonnaise and fresh herbs, instead of the poached egg. Instead of balsamic vinegar, make a reduction of white wine and a few saffron strands: Remove the asparagus from the pan, add about 150 ml white wine, 1 tsp of white balsamic to the pan along with a few strands of saffron, let simmer until syrupy and drizzle over the asparagus. Use dry roasted almond flakes instead of pine nuts. …and a brocante at Collonges la rouge. Elsewhere it may be cold and rainy, but here in Correze, France, it seems we have skipped spring and jumped straight into summer. Browsing the brocante in Collonge la rouge this past Easter weekend, couldn’t have been more perfect, The brocantes are starting off with full force and every weekend one can pick and choose between several. I prefer the small town, more informal ones with jovial, hearty conversations and laid back country side ambiance. Collonges la Rouge counts as one of “The most beautiful villages of France” and is a charming little 800’s village with its rustic red stone. In a next post I’ll show and tell more about it. We can never do it any other way..always start off with a coffee! With our weather being somewhat cooler and the rain pouring down constantly, our bones are in need of some warmer nourishment. The grey skies whispered lemon chicken. So we had the old classic, lemon chicken with herbs. An ever popular meal, so easily done in the oven and sliced at the table, which leaves you with ample time to indulge in that book you just glance at every time you speed past it. Do I need to give the recipe? Take a chicken, clean it. 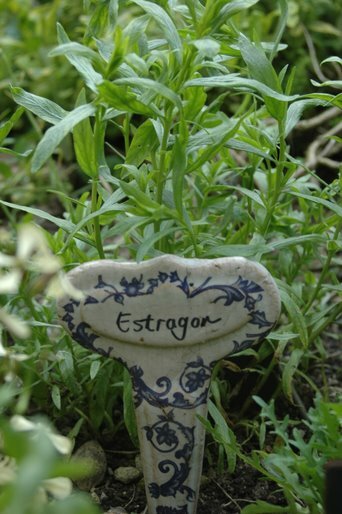 Flee into your garden and cut herbs to heart’s delight…tarragon is a must. Lemon cut into chunks is a must. As is some butter, salt and pepper and two or three shallots. Then just stuff the chicken with all ingredients, rub with olive oil and season with salt and pepper. Bake in a 180 deg. C oven for about an hour or until you have clear juices running when piercing the chicken into the thick flesh of the thigh next to the bone, normally the part which takes the longest to cook. Turn the chicken over and drizzle often with the pan juices. In the meantime prepare some vegetables. I used green asparagus, of which I snapped the ends off and some cherry tomatoes. Clean and dry them. When the chicken is done, remove from the pan and cover with foil on a serving platter. Skim off the excess fat from the pan. Arrange the asparagus in the pan and roast at 200 deg. c until nicely caramelized. Add the tomatoes 10 minutes before the asparagus is done and roast until the tomatoes start shrinking. Serve on the platter alongside the chicken, drizzle with the pan juices and serve the rest of the sauce on the side. This is an entry for WHB, whith this week’s host being Wandering chopsticks.